Essay topics: The charts below give information about endangered plants around the world. 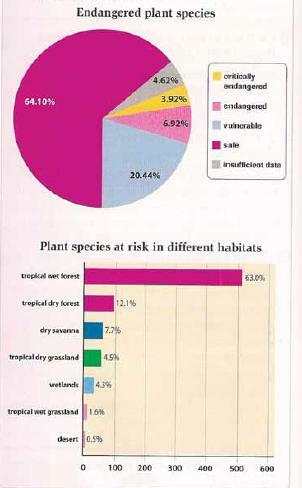 The table and pie chart illustrate details about what plants species are endangered, and which habitats they grow. Firstly, less than 65 per cent of plants are safe. However, more than 20 per cent are vulnerable and almost six per are endangered plants. Moreover, it is a remarkable number that about 4 per cent from total population of plants are critically endangered whilst 4.65 per cent remains unknown. On the other hand, from seven habitats, plants that grow in tropical wet forest are the most at risk, as the chart shows more than 63 per cent of them. Another figure pictures less than 100 plants in six different habitats are also in critical status. As desert contains lesser plant species, the number of its endangered flora is the least, just by 0.5 per cent. Overall, by observing those bars, we can take it into account that people should preserve the habitats and its plants. Particularly, tropical wet plants should been protected by them who live near its habitat.